The Thylacine family consists of two adults and three juvenile joeys. One adult is standing and is a bit over 14 cm. and 6 1/2 cm tall. One adult is lying down and is 9 cm across and not quite 6 cm tall. How each Thylacine is individually hand Crafted. eyes, lips, teeth and noses.....and the stripes on each animal is hand painted with no template, so each one is slightly different from the others. They're so beautiful! I love thylacines, and I still believe there are some out there hiding from us (which is quite understandable, given how humans have treated them). I'm very happy with them. Also, the female I got was wearing an adorable little heart shaped necklace (removable) which is so cute. I love them. They're as lifelike as painted sculptures can be. Lovely figurines, I love them and they made a great addition to my collection. Absolutely incredible. Worth every cent. Arrived quickly and in excellent condition. The DVD itself was great - very informative. 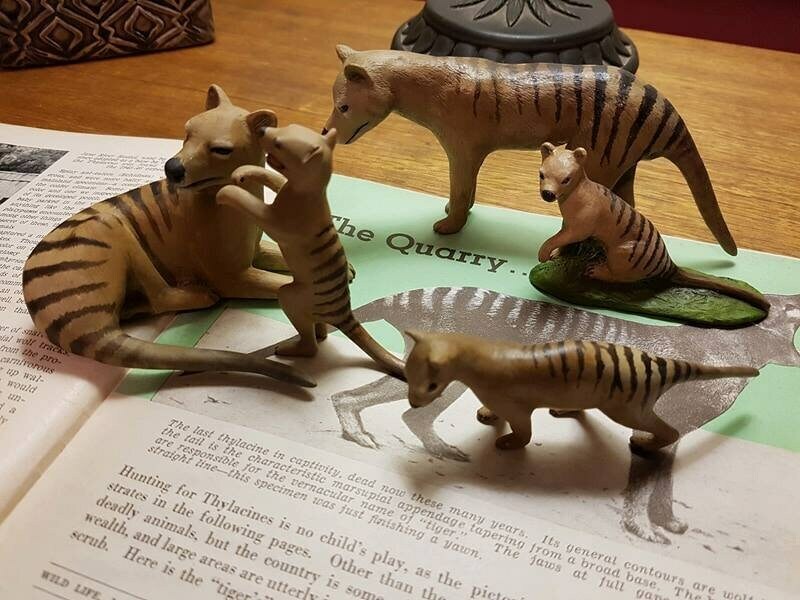 Even as a Thylacine aficionado, it contained a lot of information that I didn't know, especially about the documented history of the Thylacine on the Australian mainland. Well-worth buying!